Denny Hamlin (Joe Gibbs Racing) finally reaches his first win of the season at New Hampshire Motor Speedway’s Overton’s 301, the 19th round of the 2017 Monster Energy NASCAR Cup Series season. For the driver of #11 Toyota Camry it’s his 30th Cup Series victory in a career and third win at 1.058-mile track in Loudon. It’s also the first win of the season for Joe Gibbs Racing. Kyle Larson (Chip Ganassi Racing) crossed the finish line in the second place, half a second behind Hamlin. Furniture Row Racing’s Martin Truex Jr, who started from pole and won Stage 1 earlier in the race, came home third, ahead of Matt Kenseth. Kevin Harvick completed the top 5. Truex led for most laps (137 of 301) during the race. 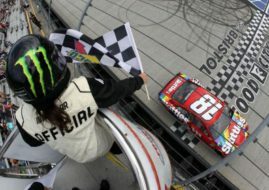 Kyle Busch was leading for 95 laps, collecting valuable playoff points with Stage 2 victory. Denny Hamlin was leading for 54 laps before taking his first win of the season. The next race is Brickyard 400 at the Indianapolis Motor Speedway.